Leopold's February chapter is fraught with symbolism. To heat his weekend cabin, he cuts down the "Good Oak." With its growth rings easily visible, Leopold follows his saw...cutting backwards through the years. The oak has watched over great changes in the landscape and in wildlife populations--and human-kind's interactions with wildlife. I've traveled to Leopold's "Shack" in Sand County, and I've stood at the spot where the Good Oak grew. There's a plaque to mark the spot...kind of spooky for Aldo-ites who know the story. I spent the day, today, at the Public Library in Nebraska City. The city served as the launching-off point for ox wagons that serviced the various forts on the Frontier, and people like Morton (salt fame) grew exceedingly rich. Small town now, but it has quite a history. I was digging through history in the library, much like Leopold was digging through history as he viewed the Oak's stump. I happened upon a real gem: A. J. Leach's "Early Day Stories." Published in 1916, the book relates stories experienced by Leach, who journeyed into Nebraska as a pioneer teenager in 1852. He eventually settled in Antelope County, home of current-day Neligh in eastern north-central Nebraska--in the transition between the Sandhills and the former tallgrass prairies of eastern Nebraska. Leach's stories include the wagon train journey with his family in 1852, as well as stories from the 1860's and 70's when he searched for and established his own homestead. As opposed to other accounts that I have read, Leach focused most on wildlife that was around him. At one point, he begs Nebraska schools to teach bird studies to all youth so that they will learn more of their surroundings. Remember he was writing this in 1916! or marred many of the beautiful things that were found in Antelope county. By the end of this paragraph, Leach appears to convince himself that the loss of wildlife may be just an unavoidable hurdle in the path of progress. Amazing to think that 100 years ago, people were marveling at the speed at which information travels! skunks had been scarce when he came in 1869; by 1916, they were very abundant. swift fox (now only found in far west and southwest Nebraska) were easily trapped because they did not enjoy the cunning of their cousin, the red fox; Leach thought they had probably been extirpated by 1890.
jackrabbits had dramatically decreased in number, except where there were large patches of pasture land. buffalo were gone by July 1872 (3 years after he arrived to homestead); he had described their omnipresence when he entered the state in 1852.
elk and mule deer (he calls them 'black tails') remained for 5-6 years beyond the buffalo; "white tails" were mostly gone after 1890.
beaver were gone by 1880; they had been in every stream in 1869.
otters were gone by 1888.
wild turkey, magpies, ravens, and curlews (all once common) were rarely seen by the time of his writing in 1916.
wild geese, wild ducks, prairie chickens, sharp-tailed grouse, pelicans, "blue herons", and "white swans" (probably trumpeters) had been "greatly diminished" in his time. Leach lists several other bird species that had increased, held their own, or were new to his area. In doing so, he makes a dramatic point that the wildlife in Antelope County had experienced significant turnover within the time of one generation. These are stories we read, in generality, in textbooks about the American West. But, to read the witness of a single person about a county I know in Nebraska is especially impressive. Leach's words are like the Oak's growth rings. A testament to the passage of time and the potential for humans to have dramatic impact (positive or negative) on the fellow passengers on the voyage, as Leopold would say. Something to ponder on a late winter day. "Rest! cries the chief sawyer, and we pause for breath." 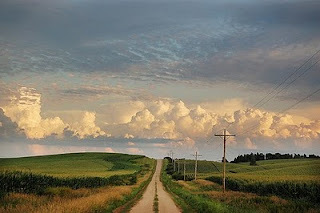 Image is public image of modern-day Antelope County taken by Matt Steinhausen.